Come and discover what’s on at Longfield Hall this autumn – there’s lots to like! Join the community arts theatre in Camberwell for laugh-out-loud comedy, thought-provoking drama, music, family shows and events designed just for kids. Afonja’s Minstrel blends influences from African music with medieval French troubadour songs, opera and theatrical storytelling. Juwon Ogungbe’s powerful piece of concert theatre follows the history of the Yoruba Oyo Empire, and examines how it evolved from one of the most powerful empires of Western Africa, to be absorbed into the contemporary troubled state of Nigeria. Borderline: Welcome to the UK features a mixed cast of refugees and European performers. Jam Art’s Youth JAM cabaret of dance, song, music and spoken word will showcase a wealth of local young talent. Jam Arts provide professional support to develop young people’s artistic skills: begin your passion for the arts! The Red Balloon tells the story of a small boy's friendship with a balloon. 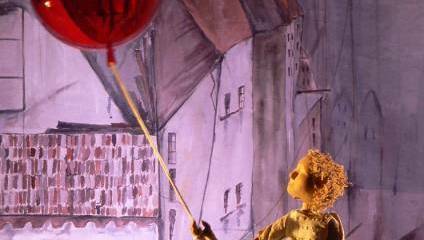 Using long-string wood-carved marionettes, and accompanied by specially commissioned music, this spell-binding show transports both adults and children into the poignant world of the puppet characters. Visit their website to see the full range of exciting events.